I offer a range of illustrated talks for schools and colleges that help enhance subject teaching, inspire, or provoke deeper thinking on an issue. I am well placed to see the educational value of my talks, and to extract the key points. I can provide school talks on a variety of travel, environmental, and geographical themes, bringing together ideas gleaned from a wide range of experiences. I have been used often for enrichment days and can also provide an assembly talk which includes slides that also act as a taster for the talks later in the day. I love sharing all these great geographical stories. We live on a fascinating planet and there is so much to enthuse young geographers about, and inspire them to engage with a subject that helps them understand the world. I can often visit a school while in the area for another speaking engagement, thereby reducing travel expenses. My attitude when booked by a school is that I should be used as much as possible! I don't mind how early I start, or how late I finish. The King Edward VI school, for example, used me to deliver talks throughout the school day on Montserrat, Iceland, Pompeii, climate change, volcanoes, and ocean floor research. Harrow School, and the Royal Masonic School for Girls, used me to deliver an abbreviated version of my Montserrat talk to four geography classes as part of their curriculum studies, before giving a whole school talk in the evening. Antarctic environmental science has loomed large in my professional life. Ozone depletion, climate change and plate tectonics have all given up secrets to scientists studying in one of the harshest environments in the world. I explore Antarctica with world class environmental scientists and look at why it is so important to our understanding of the planet and what the future might hold. Iceland is a fantastic natural laboratory where exciting earth processes can be observed. Using my experience as an Icelandic guide, coupled with my geology background, I show what the country can teach us about modern plate tectonic and volcanic processes. In 1995 I was catching bats and snakes on a conservation project when the volcano started erupting and evacuations were declared. This talk gives insights into how science fieldwork is conducted (and the difficulties and sampling strategies), the initial social impacts on the population, as well as looking at how geographers assess volcanoes and produce hazard maps to help with the evacuations that I witnessed. I also describe witnessing the first eruption and how I nearly died. My first visit to Hawaii had me collecting molten lava from a lava lake draining into the sea. On my latest visit, I explore all the volcanic and geological features that make this such a geographically fascinating location. While unique, it also offers insights into wider plate tectonic matters. It also faces vulnerability to other natural hazards, like tsunamis, and impacts and adaptations will be looked at. Using my expertise as a guide to Pompeii, Herculaneum and Vesuvius, I look at why the area is so volcanically active, the impacts and adaptations of past eruptions, and the plans for evacuating the most volcanically dangerous area in the world when Vesuvius next erupts. I use my knowledge of other volcanic areas to provide additional insights. There are lots of fascinating stories geology has to tell, whether it's setting the scene for our understanding of evolutionary time or explaining why we have the rocks we do in Britain. This talk will enthuse pupils about the richness that can be gleaned by looking at the geological landscape with an enquring mind. It features striking images from many of my travels. I accompanied an expedition in the Pacific on the marine research ship JOIDES Resolution. This is part of the international program that started in 1968 to explore the seafloor. It has contributed to a greater understanding of plate tectonics and climate change. Come on board and learn what it's like to conduct scientific research in one of the most difficult environments in the world. I tackle important issues in a topical and entertaining way, using my knowledge as a university environmental lecturer with practical examples based on my travels. My most popular environmental talk, receiving rave reviews. It looks at how we satisfy our needs for energy, what goes wrong when we fail, sustainability, and what are the ethical and moral dilemmas involved. I have tutored on environmental issues for many years. My climate change talk examines impacts, measuring environmental change, and how evidence is collected and interpreted. The fascinating detective work of proxy data gathering is also looked at. Is there anywhere on Earth where one can be sure that one is experiencing nature unaltered by our activities? If not, does it matter? In this talk I will explore the idea that nature is no longer an unchanging, absolute entity that is larger than us and will always be there to sustain, console and awe inspire us. To what extent should jobs come before the environment e.g. threatened species? Does a concern for the environment damage a national economy or enhance it? This talk looks at how we place a value on the environment. "Many thanks for an exceptionally stimulating and enriching day. The talks were first class. I particularly enjoyed being taken on the Antarctic and Montserrat journeys! See you back here in the future." "David's visit to Balshaw's High School was invaluable to the Key Stage 4 pupils he presented to on the subject of Montserrat. They were genuinely inspired by his stories, insights and wide ranging coverage of issues affecting the island as a result of the eruptions. David's professionalism, wit and in depth knowledge of his subject were appreciated by the pupils who were lucky enough to attend the day talks, but also by members of the public who came to the evening lecture. A fantastic day, something I would happily repeat every year!" 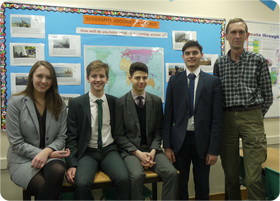 "David inspired our Year 8 and 9 pupils with his vivid account of life in the bush in Botswana. Our pupils now know how to survive close encounters with elephants, hyenas and lions and what a struggle it is for survival in an arid environment. This talk fitted in so perfectly with the work the pupils are currently covering on sustainability and conservation issues. David's account of his experiences in his recent expedition to Antarctica in 2013 were shared so knowledgeably with our A-level Geographers. The horrific smell of penguin guano, the ice carved landscapes and the evidence for climate change gripped the student's imaginations. David then delivered a hugely thought provoking lecture to the Sixth form on our energy future, a topic that is incredibly useful for physics, economics, general studies and Geography students. 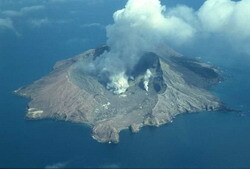 The climax of the day was the evening lecture to parents and pupils on the volcanic eruption on Montserrat . The audience was enthralled and entertained by David's hilarious stories of tree frog and snake capture as he explained the biodiversity work he was involved in when the volcano erupted. His account of the impacts of the eruption and the responses to the disaster was truly memorable. David is a wonderful speaker who manages to pitch the talk so cleverly to his audience so that every age group were thoroughly engrossed. We very much hope that David will be able to revisit Westholme School in the future." "I am writing to thank you once again for the outstanding talk you gave here on The Grand Canyon. Many students have commented on the lecture since last Tuesday - they clearly found it as inspiring and exhilarating as I did. Your commentary really brought home the uniqueness of the place. Your use of anecdotes and humour was greatly appreciated by us all, and I thought one of the most important features of the talk was the invitation to consider the broader environmental issues." “David Edwards' lectures on Montserrat and Antarctica were thoroughly enjoyable and brought to life both through fantastic photographs and film clips and his humorous and educational style. I would recommend David without hesitation if you are looking to inspire your students about the world." A two page pdf download. Or email me for a hard copy. Am I already booked to be in your area? I am guiding a number of trips over the winter and spring to Pompeii, Vesuvius and Iceland. Alison Murray, Berkhamsted School geography dept.